The easiest way to reveal national character is obviously countrywide mechanized combat, giving everyone in the country a ton of explosion-powered armored shell, contradictory objectives, and setting them loose. Aka “traffic”. On my travels I’ve noticed that different countries drive different models – not models of car, but models of how to describe their driving. English traffic is an electrical circuit with incredibly large four-wheeled electrons, because the English instinct to queue is stronger than a classroom hearing the phrase “Ell Emm En Oh Pee”. If the entire country was projected into non-Euclidian Escher-space by Dr Spacebender, they’d form orderly lines to escape. The whole system is enforced by politeness instead of physics, and it’s hard to say which more powerfully dominates English behavior. Transgressors are fixed with more powerfully disapproving stares than Cyclops looking over his glasses at you. The occasional idiot still tries to short-circuit things by skipping ahead, but that’s regarded as an error, and the system is designed to deliver the correct results despite such stupidity. Even the architecture of Rome is an ever-changing flow breaking against solid rocks, with waves of modern construction lapping at the edges of immovable masses of antiquity. It’s no surprise their traffic is liquid too. It aims for laminar flow, pouring through any crack in the buildings it can find, but often snarls up in turbulent vortices. (You get a fairly large Reynold’s number when your fluid volume element is a Fiat.) And as any advanced fluid mechanic or Italian taxi driver will tell you, turbulent flow is much slower. Like any warm liquid environment it has evolved a host of odd-looking and brightly colored responses to the challenge of movement. 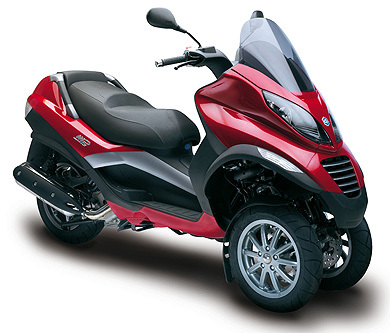 The first time you see a Piaggio it looks ridiculous. The second time you see it, cutting through a traffic blockade which would stop a reasonably determined army, it makes a lot more sense. The toy-like reverse-trike can turn on a sixpence and still get change. It’s the opposite of the Italian motorbike, which looks cool the first time you see it, then stupid the second time, in the exact same place, half an hour later. Not moving is the exact opposite of the motorcycle’s function. Anyone on a motorbike trying to turn as sharply would have to hit the ground, becoming the first petrol-powered cyborg breakdancer. These Rome-adapted scooters encrust every niche of the rocky city, like clusters of barnacles, ready to rush out and get (great Italian) food the instant the tide of cars falls. And you’ll need one if you’re going to get around. In most modern cities the subway is a circulatory system, but around Rome it’s emergency life support, a series of tubes arranged around the outside of the city, but it doesn’t dare cut into all the ancient and fragile things inside. Viscous flow is where the fluid experiences friction. Think of pouring maple syrup compared to water. Then think of a city filled with maple syrup while big balls of Velcro all desperately try to push through the same tiny gaps at the same ridiculous time, and you’ll still have no idea how terrible the traffic in Qing Dao is. Because even if you headbutt hammers for a living you won’t make decisions as dumbass as these drivers. A driver will turn sideways and block two lanes of oncoming traffic if it gets them one meter closer to a full car park, and they’ll sit there until a space opens up. Qing Dao doesn’t have traffic, it has a vast morality tale about how selfishness prevents anybody getting anything. Most places have murderously psychopathic drivers who behave as if nobody else is real. Qing Dao drivers takes that to the next level, behaving as if everyone else is the murderer: not only do you need to escape the traffic as quickly as possible, but if you actively prevent everyone else from getting to their objectives you’re actually doing a the world a favor. Most liquid of all is Qing Dao’s supersaturated solution of vehicles, a fluid loaded with more of something than it can actually carry, so the least disturbance causes cars to crystallize out in an ever-expanding perfect crystal: bright, shining with red lights, and motionless. This happens every morning and evening for several hours. And still nobody ever stops driving, despite “stopped” and “driving” becoming synonymous. This entry was posted in Uncategorized and tagged global positioning scribbles, traffic. Bookmark the permalink. I feel as if the Reynolds number reference is reversed. If I remember correctly, +++Reynolds number is good, because it implies less parasitic drag and less viscous effects on the aircraft? So if the joke is that Fiats introduce a system with higher viscosity, then wouldn’t that mean that they LOWER the Reynolds number? Higher viscosity certainly would be a lower Reynold’s number, but I was aiming for the turbulent flow caused by every driver trying to twist past all the others, and turbulence is high Reynold’s all the way (it’s hard to get eddies in honey). Qing Dao is more the low Reynolds = molasses example. Ah, well then, that makes more sense. Reynolds Number has like four different definitions based on the situation, so I wasn’t sure. Thanks!